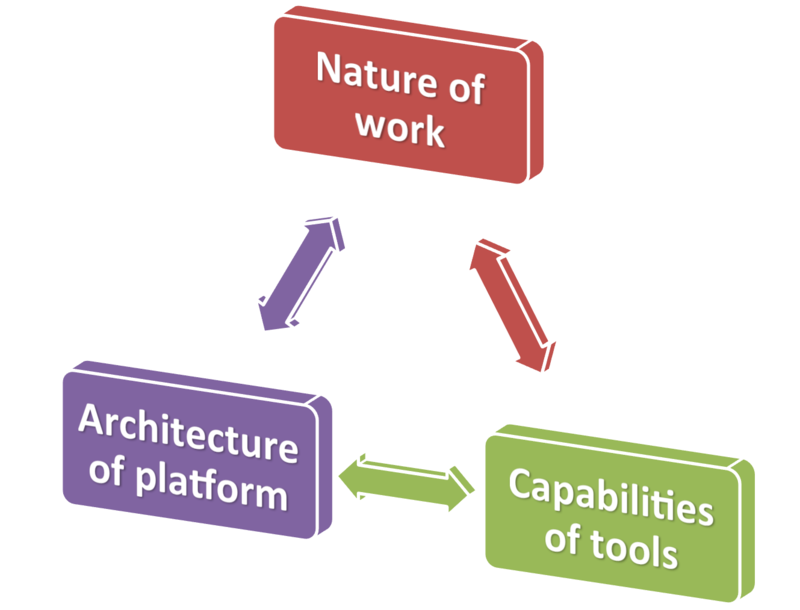 Cycle of nature of work, capabilities of tools, architecture of platform. Are tablets the next big thing, a saturated market (already), dead (! ), or just in a lull? The debate continues while the sales of tablets continue to outpace laptops and will soon overtake all PCs (of all form factors and OS). What is really going on is an architectural transformation—the architecture that defined the PC is being eclipsed by the mobile OS architecture. The controversy of this dynamic rests with the disruptive nature—the things that were easy to do with a PC architecture that are hard or impossible to do with a mobile OS, as well as the things in a mobile OS that make traditional PCs seem much easier. Legacy app compatibility, software required for whole professions, input preferences, peripherals, and more are all part of this. All of these are also rapidly changing as software evolves, scenarios adapt, and with that what is really important changes. Previous posts have discussed the changing nature of work and the new capabilities of tools. This post details the architecture of the platform. Together these three form an innovation cycle—each feeding into and from each other, driving the overall change in the computing landscape we see today. 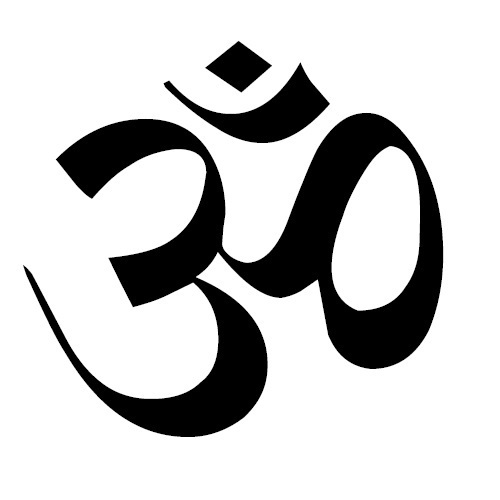 The fundamental shift in the OS is really key to all of this. For all the discussed negatives the mobile OS architecture brings to the near term, it is also an essential and inescapable transition. Often during these transitions we focus in the near term on the visible differences and miss the underlying nature of the change. During the transition from mini to PC, the low price and low performance created a price/performance gap that the minis thought they would exploit. Yet the scale volume, architectural openness, and rapid improvement in multi-vendor tools (and more) contributed to a rapid acceleration that could not compare. During the transition from character-based to GUI-based PCs many focused on the expense of extra peripherals such as graphics cards and mice, requirement for more memory and MIPs, not to mention the performance implications of the new interface in terms of training and productivity. Yet, Moore’s law, far more robust peripheral support (printers and drivers), and ability to draw on multi-app scenarios (clipboard and more) transformed computing in ways character-based could not. The same could be said about the transition to internetworking with browsers. The point is that the ancillary benefits of these architectural transitions are often overlooked while the dialog primarily focuses on the immediate and visible changes in the platform and experience. Sometimes the changes are mitigated over time (i.e. adding keyboard shortcuts to GUI or the evolution of the PC to long file names and real multi-tasking and virtual memory). Other times the changes become the new paradigm as new customers and new scenarios dominate (i.e. mouse, color, networking). The transition to the mobile OS platforms is following this same pattern. For all the debates about touch versus keyboard, screen-size, vertical integration, or full-screen apps, there are fundamental shifts in the underlying implementation of the operating system that are here to stay and have transformed computing. We are fortunate during this transition because we first experienced this with phones that we all love and use (more than any other device) so the changes are less of a disconnect with existing behavior, but that doesn’t reduce the challenge for some or even the debate. The mobile OS as defined by Android, iOS, Windows RT, Chrome OS, Windows Phone, and others is a very different architecture from the PC as envisioned by Windows 7/8, Mac OS X, Linux desktop. The paradigm includes a number of key innovations that when taken together define the new paradigm. ARM. ARM architecture for mobile provides a different view of the “processor”: SoC, multi-vendor, simpler, lower power consumption, fanless, rich graphics, connectivity, sensors, and more. All of these are packaged in a much lower cost way. I am decidedly not singling out Intel/AMD about this change, but the product is fundamentally different than even Intel’s SoCs and business approach. ARM is also incompatible with x86 instructions which means, even virtualized, the existing base of software does not run, which turns out to be an asset during this change (the way OS/360 and VMS didn’t run on PCs). Security. At the heart of mobile is a more secure platform. It is not more secure because there are few pointers in the implementation or fewer APIs, but more secure because apps run with a different notion of what they can/cannot do and there is simply no way to get apps on the device that can violate those rules (other than for developers of course). There’s a full kernel there but you cannot just write your own kernel mode drivers to do whatever you want. Security is a race of course and so more socially engineered, password stealing, packet sniffing, phone home evil apps will no doubt make their way to mobile but you won’t see drive by buffer overrun attacks take over your device, keystroke loggers, or apps that steal other apps’ data. Quality over time and telemetry. We are all familiar with the way PCs (and to a lesser but non-zero degree Macs) decay over time or get into states where only a reformat or re-imaging will do. Fragility of the PC architecture in this regard is directly correlated with the openness and so very hard to defend against, even among the most diligent enthusiasts (myself included). The mobile OS is designed from the ground up with a level of isolation between the OS and apps and between apps that all but guarantee the device will continue to run and perform the way it did on the first day. When performance does take a turn for the worse, there’s ongoing telemetry that can easily point to the errant/causal app and removing it returns things to that baseline level of excellence. App store model. The app store model provides for both a full catalog of apps easily searched and a known/reviewed source of apps that adhere to some (vendor-specified) level of standards. While vendors are taking different approaches to the level of consistency and enforcement, it is fair to say this approach offers so many advantages. Even in the event of a failure of the review/approval process, apps can be revoked if they prove to be malicious in intent or fixed if there was an engineering mistake. In addition, the centralized reviews provide a level of app telemetry that has previously not existed. For developers and consumers, the uniform terms and licensing of apps and business models are significant improvements (though they come with changes in how things operate). All day battery life. All day battery life has been a goal of devices since the first portable/battery PCs. The power draw of x86 chipsets (including controllers and memory), the reliability challenges of standby power cycles, and more have made this incredibly difficult to reliably “add on” to the open PC architecture. Because of the need for device drivers, security software, and more the likelihood that a single install or peripheral will dramatically change the power profile of a traditional device is commonplace. The “closed” nature of a mobile OS along with the process/app model make it possible to have all day battery life regardless of what is thrown at it. Always connected. A modern mobile OS is designed to be always connected to a variety of networks, most importantly the WWAN. This is a capability from the chipset through the OS. This connectivity is not just an alternative for networking, but built into the assumptions of the networking stack, the process model, the app model, and the user model. It is ironic that the PC architecture which had optional connectivity is still less good at dealing with intermittent connectivity than mobile which has always been less consistent than LAN or wifi. The need to handle the constant change in connectivity drove a different architecture. In addition, the ability to run with essentially no power draw and screen off while “waking up” instantly for inbound traffic is a core capability. Always up to date apps/OS. Today’s PC OSes all have updaters and connectivity to repositories from their vendors, but from the start the modern mobile OS is designed to be constantly updated at both the app and OS from one central location (even if the two updates are handled differently). We are in a little bit of an intermediate state because on PCs there are some apps (like Chrome and Firefox, and security patches on Windows) that update without prompts by default yet on mobile we still see some notifications for action. I suspect in short order we will see uniform and seamless, but transparent, updates. Cloud-centric/stateless. For decades people have had all sorts of tricks to try to maintain a stateless PC: the “M” drive, data drives or partitions, roaming profiles, boot from server, VM or VDI, even routine re-imaging, etc. None of these worked reliably and all had the same core problem, which was that whatever could go wrong if you weren’t running them could still go wrong and then you’re one good copy was broken everywhere. The mobile OS is designed from the start to have state and data in the cloud and given the isolation, separation, and kernel architecture you can reliably restore your device often in minutes. Touch. Touch is the clearly the most visible and most challenging transition. Designing the core of the OS and app model for touch first but with support for keyboards has fundamentally altered the nature of how we expect to interact with devices. No one can dispute that for existing workloads on existing software that mouse and keyboard are superior and will remain so (just as we saw in the transition from mainframe to mini, CUI to GUI, client/server to web, etc.) However, as the base of software and users grows, the reality is that things will change—work will change, apps will change, and thus work products will change, such that touch-first will continue to rise. My vote is that the modern “laptop” for business will continue to be large screen tablets with keyboards (just as the original iPad indicated). The above value propositions matter even more to todays mobile information worker as evidenced by the typical airport waiting area or hotel lobby lounge. I remain certain that innovation will continue to fill in the holes that currently exist in the mobile OS and tablets when it comes to keyboards. Software will continue to evolve and change the nature of precision pointing making it only something you need for PC only scenarios. Enterprise management. Even in the most tightly managed environment, the business PC demonstrates the challenges of the architecture. Enterprise control on a mobile OS is designed to be a state management system, not a compute based approach. When you use a managed mobile device, enterprise management is about controlling access to the device and some set of capabilities (policies), but not about running arbitrary code and consuming arbitrary system resources. The notion that you might type your PIN or password to your mobile device and initiate a full scan of your storage and install an arbitrary amount of software before you can answer a call is not something we will see on a modern mobile OS. So many of the previous items in the list have been seen as challenges by enterprise IT and somewhat ironically the tools developed to diagnose and mitigate them have only deepened the challenges for the PC. With mobile storage deeply encrypted, VPN access to enterprise resources, and cloud data that never lands on your device there are new ways to think of “device management”. Each of these are fundamental to the shift to the mobile OS. Many other platform features are also significantly improved such as accessibility, global language support, even the clipboard and printing. What is important about these is how much of a break from the traditional PC model they are. It isn’t any one of these as much as the sum total that one must look at in terms of the transition. Once one internalizes all these moving parts, it becomes clear why the emphasis on the newly architected OS and the break from past software and hardware is essential to deliver the benefits. These benefits are now what has come to be expected from a computing device. While a person new to computing this year might totally understand a large screen device with a keyboard for some tasks, it is not likely that it would make much sense to have to reboot, re-image, or edit the registry to remove malware, or why a device goes from x hours of battery life to 1/2 x hours just because some new app was installed. At some point the base expectations of a device change. The mobile OS platforms we see today represent a new paradigm. This new paradigm is why you can have a super computer in your pocket or access to millions of apps that together “just work”.